An unmanned Israeli drones on Tuesday attacked a group of Palestinian civilians gathering near the border fence separating the blockaded Gaza Strip from territories occupied in 1948. An Israeli drone fired a missile toward a group of Palestinians east of Jabalia town, to the north of the Gaza Strip. No injuries were reported in the offensive. The targeted youths were reportedly making up incendiary kites to respond to such aggressions by the Israeli military on the besieged coastal enclave which have gone unabated over recent weeks. GAZA, PALESTINOW.COM — A Palestinian youth died on Tuesday from wounds he sustained while participating in the Great March of Return on 14th May. Gaza’s Ministry of Health said that Majd Aqil, 26, was shot by Israeli occupation forces during the Great March of Return protests on 14th May east of Jabalia refugee camp, north of the Gaza Strip. With Aqil’s death, the number of Palestinians killed since the start of the peaceful Great March of Return on 30th March has increased to 155. According to human rights sources, Israeli occupation forces are still detaining the bodies of 8 Palestinian martyrs who were killed near the border fence during the protests. The Great March of Return mainly calls for lifting the decade-long blockade imposed on Gaza and allowing the return of Palestinian refugees to their lands from which they were expelled in 1948. GAZA, PALESTINOW.COM — The higher committe of the Great Return March and Breaking Gaza siege organised massive children protest in the vinicty of Erez crossing on Tuesday morning, calling for the international community to stop Israel from murdering the children of Palestine and breaking Gaza siege, which impacts the daily necessity of life. The event took place 2 kilometers far from Eres crossing where the children express there suffering under the Israeli Occupation and Israeli siege of Gaza. “We come here to speak up for our rights and put an End the Israeli violation of international laws” Aya, one of the participants says. The children are divided into group each group tells a story, one of the groups sheds the lights on the sufferiby of the patients children and the lack of medicin. Other groups cover the prolonged hours of electricty cut and the polluted water crisis. “” Day by Day, we prove that our Great Return March is popular and peaceful protest.” Mohamed Thrayya one of the organisers confirms. Since the beginning of the Great Return March, 18 children were shot and murdered dilebratly by the Israeli Occupation Snipers so far. Israeli soldiers abducted, Monday, two children from Deir Nitham village, west of Ramallah, in central West Bank. The two children have been identified as Mohammad Saleh and Rami Nimir; they were sitting in front of one of the boy’s homes when the soldiers abducted them. Media sources in Deir Nitham said many army jeeps invaded the village, and fired live rounds, rubber-coated steel bullets, gas bombs and concussion grenades at local protesters. The two children were taken prisoner before the army withdrew, and were not in the area of protests. The Palestinian Prisoners’ Society (PPS) has reported that Israeli soldiers abducted, on Tuesday at dawn, a woman from Hebron, and two young men from Bethlehem, in the occupied West Bank. The Hebron office of the PPS, in the southern part of the West Bank, said the soldiers searched homes throughout the city, and abducted Palestinian woman, a writer and a mother, identified as Lama Khater. 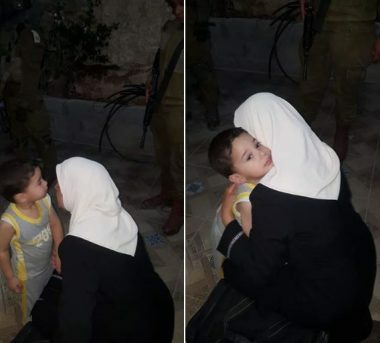 Activists managed to take a picture of the woman holding her child, and kissing him farewell, before the soldiers took her to an unknown destination. 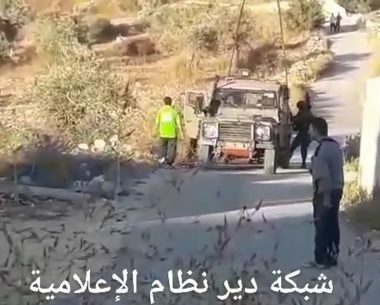 In addition, the soldiers invaded and searched homes in Hindaza area, east of Bethlehem in the West Bank, before abducting Mahmoud Ibrahim Jawareesh, 42, and Mohammad Nasser Awwad, 22. Dozens of soldiers also invaded several areas in al-Biereh city in central West Bank, especially in Sateh Marhaba area, and searched homes. The Israeli army claimed its soldiers located weapons during searched in Ramallah and al-Biereh governorate. It is worth mentioning that the soldiers invaded many homes across the West Bank, and interrogated several Palestinians while inspecting their ID cards, in addition to installing roadblocks. On Monday evening, undercover Israeli soldiers, driving a civilian car with Palestinian license plates, kidnapped two men, including a security officer, east of Qalqilia, in northern West Bank. The two Palestinians have been identified as Rashed Nizar Shbeita, 30, a Palestinian National Security officer, and Nassar Dahbour, 34, from Azzoun town, east of Qalqilia. 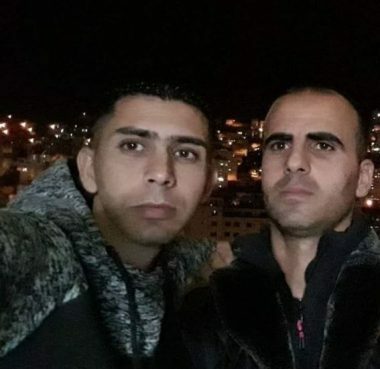 The two were driving their car when undercover Israeli soldiers, driving a car with Palestinian license plates, chased them in Azzoun town and on Azzoun-Jayyous road, before crashing their vehicle after ramming it with their car. The two were injured due to the crash, and were taken to an unknown destination by regular army units that arrived at the scene. “They have fired them at us to harm us, but we want to use them to send a message of life and peace,” he explained. 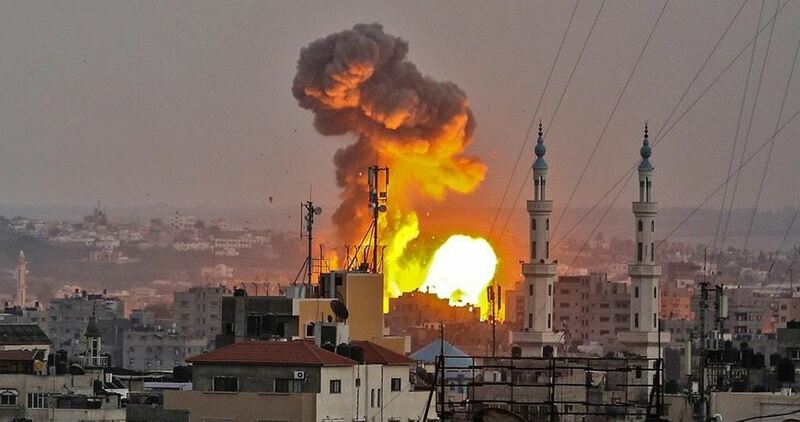 Nearly 140 Palestinians have been killed as a result of Israel’s heavy-handed response to unarmed protesters in Gaza. Some 15,000 have also been injured by live fire or as a result of suffocation from teargas inhalation. The US is fully responsible for the consequences of Israeli settler raids on Al-Aqsa Mosque, Islamic Jihad said yesterday. “We will not remain silent regarding the Israeli aggression on Al-Aqsa Mosque,” he added. He called for all the Arab and Islamic leaders to bear their responsibility to defend Al-Aqsa Mosque, stressing that they should cut their ties with the occupation state. Israeli plans to Judaise Al-Aqsa Mosque, he said, would not be accepted “whatever the price was”, stressing that Al-Aqsa Mosque would remain a “purely” Islamic and Arabic site. In its report translated by Arab21, the newspaper said Morsi is living in harsh conditions in prison. He does not have a mattress in his cell, forced to sleep on the cold floor. Besides his isolation from the world, Morsi has been prevented from reading books and even newspapers. Under these conditions, the former president cannot meet his relatives or even other prisoners. Besides these sanctions, Morsi is also prevented from receiving a doctor’s visit or the treatment for his chronic diseases. Many organisations have described Morsi’s situation as a “severe and harsh assault” and is a form of “torture”. The newspaper explained that Morsi is imprisoned in the branch of Scorpion Prison, within Tora Prison, which is known for its abuses against political prisoners. There are other Muslim Brotherhood prisoners in this prison. According to Egyptian NGOs, including the Cairo Institute for Human Rights Studies, the former president’s health could be at risk if he does not receive treatment for chronic diabetes. At sixty-six, Morsi suffered from rheumatism in his spine after sleeping on the ground for four years. Head of Popular Committee Against the Siege MP Jamal Al-Khodari said yesterday that Israel’s closure of Kerem Shalom crossing with Gaza caused the gradual collapse of the industrial and commercial sectors in the Strip, Shehab.ps reported. The Israeli occupation authorities banned about 1,000 basic commodities from entering Gaza by closing Kerem Shalom (Karm Abu Salem), Al-Khodari said, noting that 100 per cent of the crude materials are being banned. The MP said that about 2,500 trucks from Gaza, loaded with goods, have been waiting at Israeli ports as a result of the closure. He called for not using the crossings as a political tool in an effort to avoid a humanitarian disaster. On 9 July, Israel closed Gaza’s only commercial crossing further tightening the 12-year siege it has imposed on the beleaguered Strip.